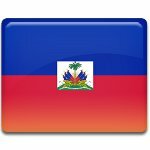 The Republic of Haiti is a small Caribbean country that occupies the western part of the island of Hispaniola (the other part is occupied by the Dominican Republic). This island was discovered by Christopher Columbus in 1492. At first Hispaniola was owned by Spain, but in 1697 France received the western third according to the Treaty of Ryswick. It became a French colony and was named Saint-Domingue. In 1791, African slaves in Saint-Domingue started a revolution which was subsequently named the Haitian Revolution. The revolution ended in 1804 by the abolition of slavery and proclamation of the Republic of Haiti by Jean-Jacques Dessalines. While in the most parts of the world people celebrate the New Year, Haitians commemorate their nation's past. The Independence Day festivities are held on January 1, and the following day is devoted to commemorating people who gave their lives fighting for freedom in the early 19th century and the founders of Haiti. Military processions can take place on this day.